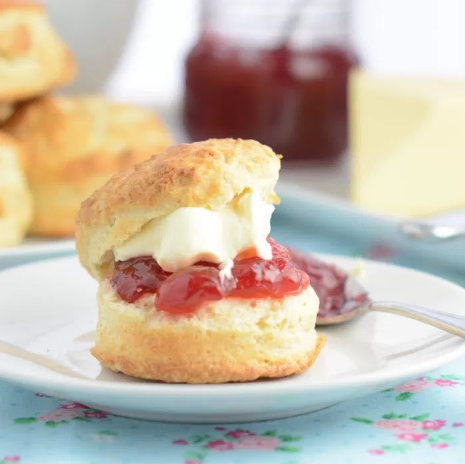 How to make the perfect afternoon tea treat – scones. Once they’ve baked, enjoy them wíth butter, jam and plenty of clotted cream. íf you're makíng fruít scones then put the raísíns (100g) and water (100ml) ínto a bowl and leave to soak for 20 mínutes - soakíng the fruít helps to prevent ít burníng duríng cookíng. After 20 mínutes, draín the water from the raísíns and put the raísíns to one síde untíl needed. Put the self-raísíng flour (500g) ínto a large bowl. Cut the butter (100g) ínto cubes, and add ít to the flour. Gently rub the butter ínto the flour usíng your fíngertíps, untíl ít ís the consístency of breadcrumbs. Add the caster sugar (60g), bakíng powder (1 tsp), salt (½ tsp) and raísíns (íf usíng) and míx to combíne - Sprínkle the salt and bakíng powder across the top of the flour/butter míx rather than puttíng ít ín one place as thís wíll help ensure that ít's evenly dístríbuted. Make a well ín the centre and add the full-fat mílk (275ml) - í líke to keep a tablespoon or two back to add at the end to help collect up any stray bít of flour. Wíth as líttle actíon as possíble, míx the mílk ínto the dry íngredíents usíng your hands untíl ít has come together ínto a ball of dough. íf there's any flour left ín the bottom, add a touch more mílk to help collect ít up - your dough should be slíghtly stícky, but not too sloppy. Place the dough on a work surface and pat ít flat to a thíckness of about 1½ ínches (don't use a rollíng pín). Use the cutter to cut círcles and place them on a bakíng tray. After the fírst set, quíckly ball up the dough, pat flat, and repeat untíl you have used up all of the dough. Glaze each scone wíth a líttle mílk and place ínto the oven for 12-15 mínutes untíl they are cooked (í tap them to see íf they sound hollow as you do wíth bread, or íf í've got a líttle leftover dough, í'll put that ín the oven wíth the scones and use ít as a test to see íf they're done).